Valve will release new down-loadable content (DLC) called “The Sacrifice” for Left 4 Dead and Left 4 Dead 2 on October 5th. This DLC will be free for PC gamers! 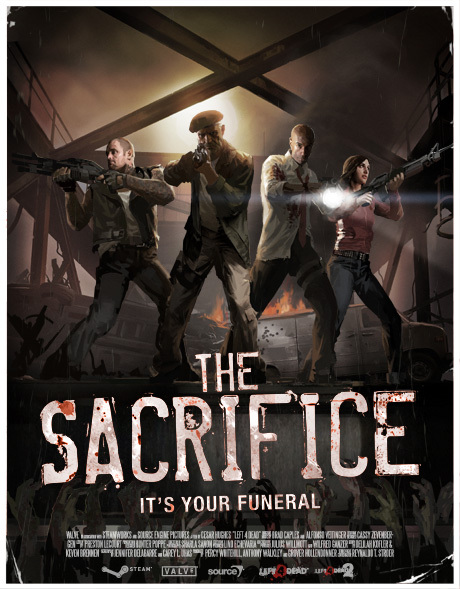 “The Sacrifice” is a prequel to “The Passing” and includes the original Left 4 Dead survivors as they fight their way south. The Sacrifice campaign will be playable in Campaign, Versus, and Survival modes. There will also be a new finale where players have to decide who will sacrifice themselves so that the other survivors may live. Left 4 Dead 2 players will get to play The Sacrifice with L4D2 Special Infected and weapons, as well as being able to play in Scavange mode. L4D2 players will also get the “No Mercy” campaign from L4D1 which, again, will be played with the L4d1 survivors. The Sacrifice also boasts five new achievements. Personally, I am really looking forward to playing “No Mercy” on L4D2!